Your gifts will make a difference for a family, a neighborhood, our city… the world! 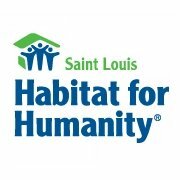 Habitat for Humanity Saint Louis is dedicated to eliminating substandard housing in St. Louis. This is accomplished by a comprehensive program that helps families who are determined to proactively better their lives by investing time and effort into actually building and owning a home. 1.PRAY for the end of substandard housing for St. Louis and for the Habitat workers. Volunteer opportunities include working on a build, helping at ReStore, working in the office, taking photographs, or serving as a site administrator. 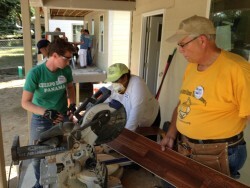 Online: Go to the WGCC Facebook page for more info or go directly to WGCC’s Habitat for Humanity Team Page to donate online: http://bit.ly/11gr29Z. Invite your friends on FaceBook to help us meet our goal. Share the link on your FB page and ask your friends to help by contributing and sharing with their friends so that we can make safe affordable housing a reality for one more St. Louis family! Cash or Check: Make checks payable to WGCC and write “Habitat for Humanity” in the memo line. carsforhomes.org: Habitat for Humanity’s Cars for Homes vehicle donation program helps your local Habitat for Humanity affiliate build homes in partnership with families in need of decent, affordable shelter in your community.